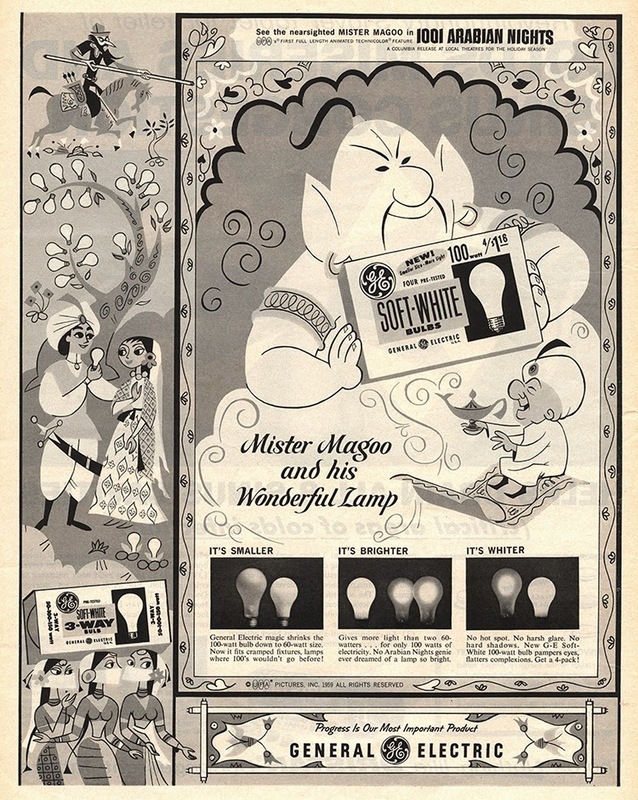 As mentioned in my book, Lee Orgel, producer of Mr. Magoo’s Christmas Carol, engaged in a rather lengthy search for a sponsor in order to get the special on the air. 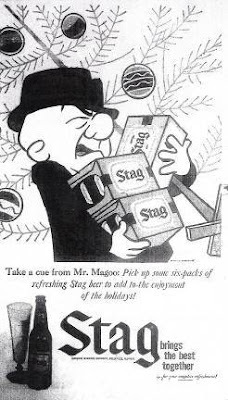 During that process, one sponsor that expressed interest was Carling Ale, who had previously used Mr. Magoo in 1958 for a year long advertising campaign for one of their labels, Stag Beer. No memos explaining their decision to decline sponsorship have been found but one possibility is that there had been a sea change in how Magoo was perceived in the few short years between 1958 and 1962. When the character first erupted on the screens, he was dug by kids but I think mostly by adults, appealing to that select group of connoisseurs who rapture joyously over the (John) Hubley and (Ernie) Pintoff offerings...The five minute cartoon TV series wiped out the avant garde fans, capitalizing instead on the tousled-haired set from five to fifteen. 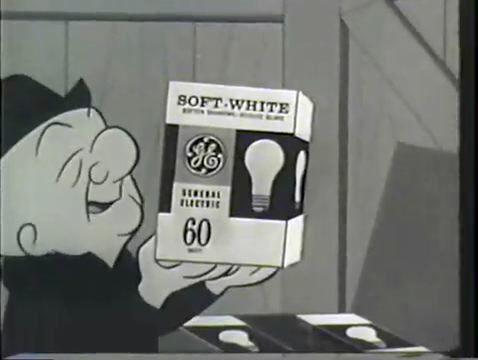 GE was the obvious, and most natural choice, to sponsor the special. I found nothing in my research on why they didn’t pick up the tab for the show although it’s quite possible they had already committed their ad budget for the year. In any event, it appears they realized their error after the success of the special and later tried to get back on board, offering to pay three-quarters of the sponsorship costs for only half of the show. Timex, the show’s final sponsor, wouldn’t budge. 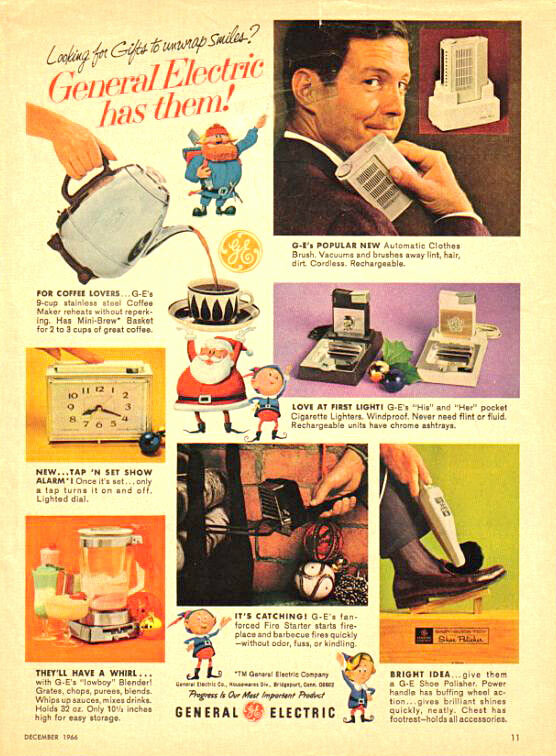 A couple of years later, GE did end up wholly sponsoring Rankin Bass’s Rudolph the Red-Nosed Reindeer to promote their small appliances. Title sequence-The original titles started with a long shot of buildings with flashing neon signs. 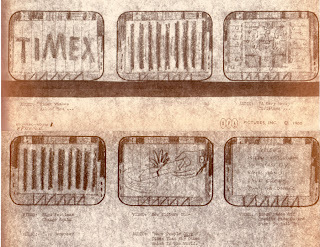 Two of those signs flashed Timex, the show's original sponsor. 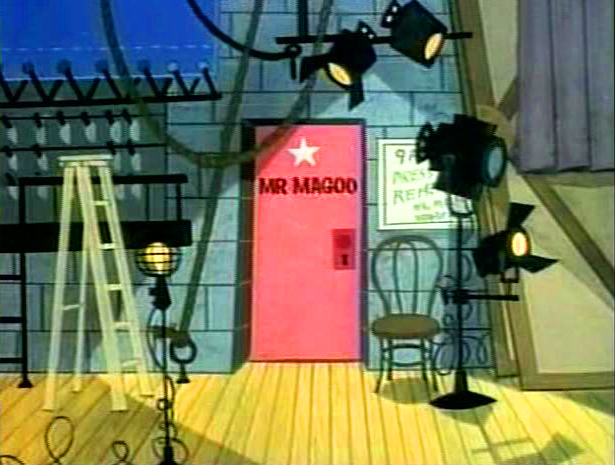 The camera then panned over to the existing title card of Mr. Magoo's Christmas Carol. 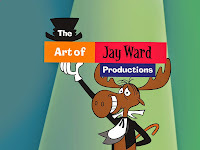 Title length was the same; the current version cycles the show's title card to cover the missing Timex credit. Prologue-As I mentioned in the book, the original version of the song, "Back on Broadway", included an entire middle section of in which the waiters at the deli chime in at key moments in the song. Styne and Merrill sang those lyrics in their demo recording and the extant sheet music also contains those lyrics. 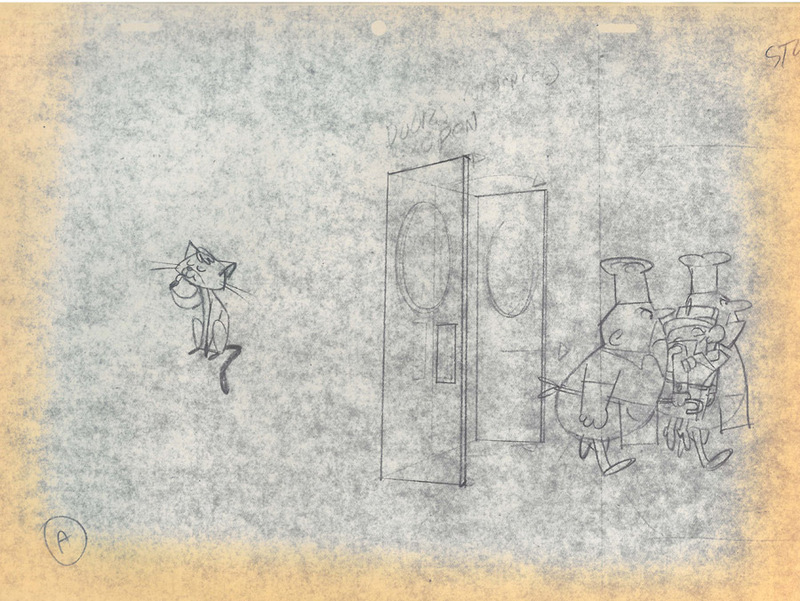 A recently discovered photocopy of a layout shows that at one point, we did go inside the restaurant with Magoo. Inside the theater-Another recent discovery shows a much more intimate version of the well-used audience shot. It went through at least one more iteration before the final version we know from the film. 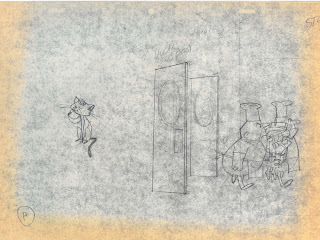 Scrooge's office-After Scrooge puts on his coat and scarf and exits, there was a scene of him at his front door in which he turns off the light and exits, slamming the door. The folder with the cels of the lighting masks still exists, sans Magoo. 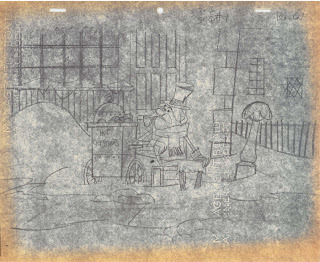 Scrooge's walk home-Here you can see an extremely rare deleted composite layout by Bob Singer from Scrooge's walk home in the snowstorm. This came immediately after he exited what is now the last scene in that sequence. Scrooge would have walked through the scene on the sidewalk in front of the hot chestnut vendor. The next scene which starts the following sequence shows him approaching his house. 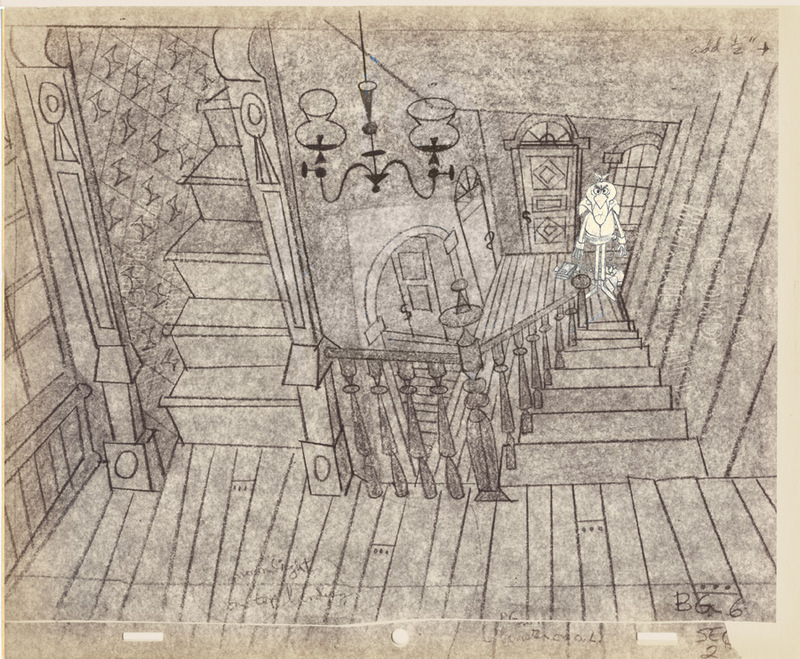 Scrooge's house-The original Marty Murphy storyboards for this sequence show the inside of Scrooge's house in a scene almost identical to the deleted background on p. 67 in the book, where the door slams behind Scrooge, foreshadowing Marley's arrival. Based on a surviving production draft, that material was never even laid out. 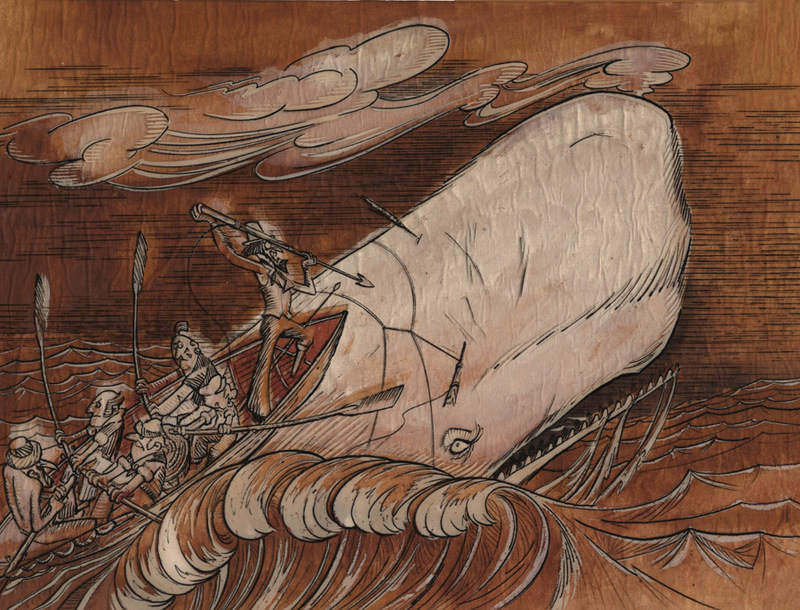 However, the background in the book was meant for a scene in which a "pulsating shape turns into Marley's ghost". 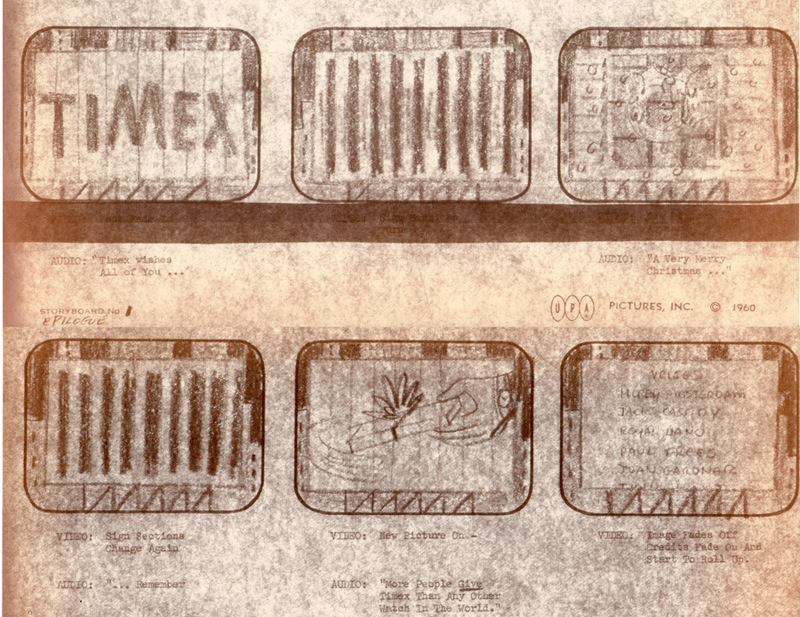 Below, Shirley Silvey's layout showing Marley's ghost after he is no longer a "pulsating shape". It's believed that the shape moved from the left of the railing to end in this final position. 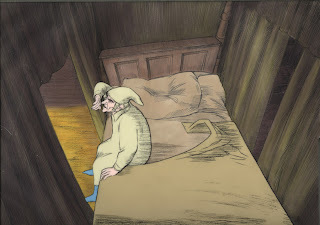 Visit by Marley's Ghost-Apparently, the scene in which Scrooge cringes as Marley's ghost flies over him before exiting did not have the ghost's shadow passing over Scrooge in the 1962 version. 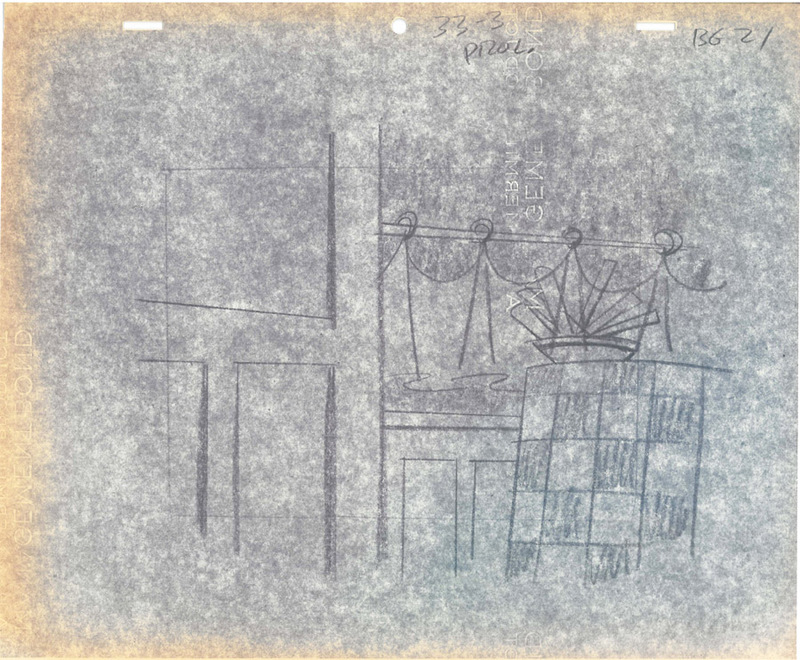 The folder for that scene has a retake date of 8/31/1963 in which the shadow pass was added. Curious that almost a year later, they were making changes to the picture. The Ghost of Christmas Past-Apparently, Lee Mishkin had a more aggressive approach to this ghost's visit. 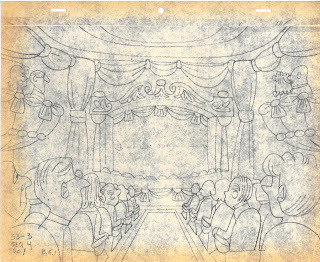 Scrooge's visit to his school-The previous post on Bonus Features for the upcoming DVD had a picture of a character, Mrs. Halsey, that was designed, inked and painted but cut from the final film. 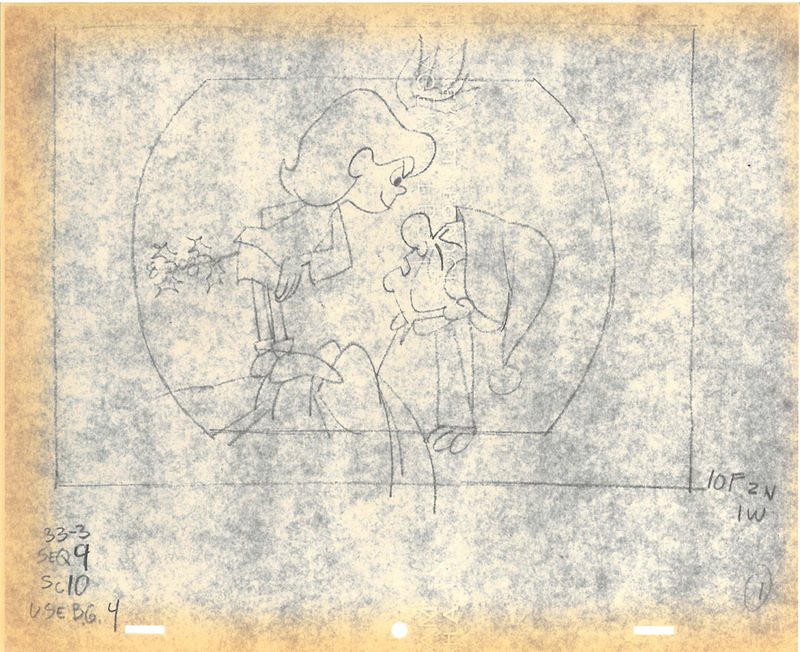 Fezziwig's/Winter Was Warm-As mentioned in the post Christmas Belles, this entire sequence was re-animated after being laid out, animated, inked, painted and shot with a different model of Belle. Also discussed in the book, "Winter Was Warm" was over twice as long, with an instrumental interlude and a second verse. 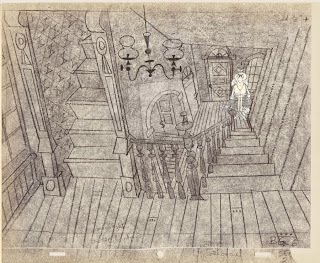 The Ghost of Christmas Past's exit-Shortly after the 32 minute mark, in Belle's parlor, the Ghost tells Scrooge, "One shadow more." There is a ripple dissolve to limbo, with Scrooge pleading on his knees, when the Ghost laughs and rises up out of the scene. 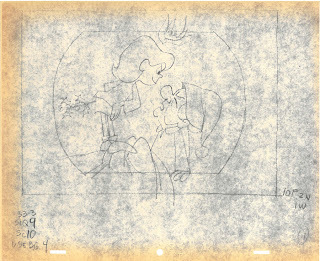 The "one shadow more" sequence would have been where Scrooge sees Belle's future life with her husband and children. It's the only deleted sequence to actually have been assigned a sequence number and it's odd that the scenes would have been laid out with a continuity break, even if the sequence had been deleted in the storyboarding stage. What seems likely is that the missing sequence had been at least laid out, if not animated, but no drawings or cels have yet been discovered for this sequence. End credits-Another retake from the 1962 version; during September of 1963, the end credits were reshot, changing two cards. It appears that Lee Orgel had once again been given Associate Producer credit, the same credit he received on Gay Purr-ee. In both cases, Orgel functioned as Producer but was denied the screen credit (i). I have found no paperwork regarding why this credit change was implemented but Orgel did leave UPA in 1963, apparently unhappy that promised profit participation in Christmas Carol and Gay Purr-ee was not forthcoming. 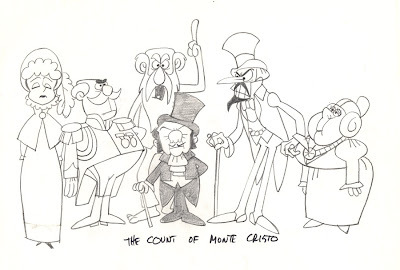 The other credit that was changed was the second to last card and although there is nothing to indicate the precise change, a reasonable guess is the addition of Stephen Bosustow's credit, Mr. Magoo created under the supervision of Stephen Bosustow. As part of Saperstein's 1960 agreement with Bosustow to buy the company, UPA was contractually bound to include this particular credit on all Mr. Magoo productions. (i) Originally, Peter DeMet, Henry Saperstein's business partner, was to receive Producer credit on Gay Purr-ee but that credit was deleted, perhaps due to his exit from UPA's affairs. No one receives Producer credit in the final film; Orgel had to settle for Associate Producer. But considering the success of the special, it's a bit puzzling that, aside from the TV commercials, Magoo made no new broadcast or film appearances during 1963. 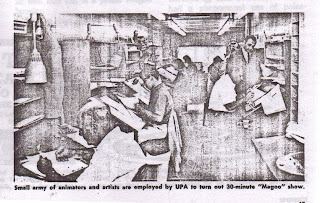 Without having access to the UPA production records, it's difficult to know exactly what happened during this "lost" year. What seems likely, though, is that UPA had been caught flat footed with the unexpected success of the special. In Hollywood, success demands more of the same so it's not unreasonable to assume that NBC immediately requested a follow up and UPA would have had to scramble to come up with something. Some of the answer to what happened in 1963 might be in a letter recently discovered in Abe Levitow's files. Although it seems like a natural progression to take the central conceit of Mr. Magoo's Christmas Carol, Magoo as an actor in literary classics, and expand it into a series, this letter indicates that the path was anything but a straight line. The letter, dated June 6, 1963, addressed to Abe Levitow, is from Chris Hayward, one of the staff writers at Jay Ward (Hayward is credited as the creator of Dudley Do-Right and future co-developer of The Munsters). 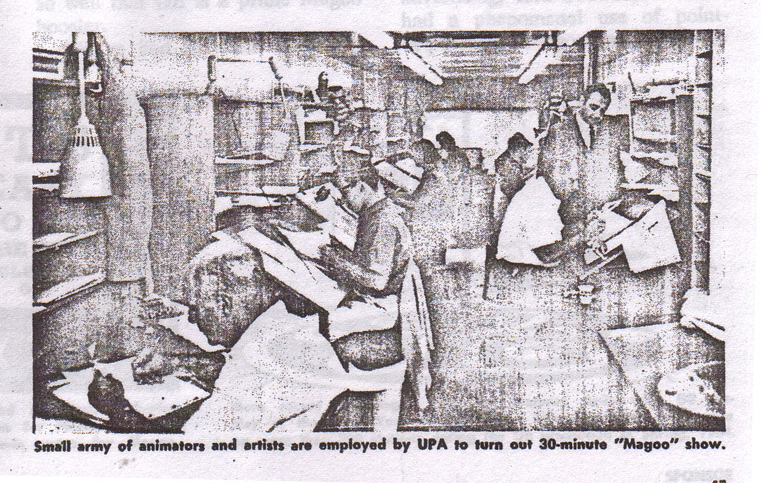 It's unusual for competing animation studios to collaborate, but in my book I note the frequent interchange of personnel between UPA and Jay Ward throughout the 1960s. Now, it appears that the relationship between the two studios might have been even closer than first realized. I think we can now generally agree that depositing Magoo in a proper and saleable vehicle provides with us what we can label one hell of an enigma. When the character first erupted on the screens, he was dug by kids but I think mostly by adults, appealing to that select group of connoisseurs who now rapture joyously over the Hubley and Pintoff offerings. The five minute cartoon TV series wiped out the avant garde fans, capitalizing instead on the tousled haired set from five to fifteen. Currently in vogue is the dashing James Bond character, hero in sundry novels and recently in motion pictures. Bond is the epitome of the secret secret service agent, thriving on deadly action, good booze, and an unending stream of delectable broads. ...Anyway, it might be fun making Magoo into a blase, man-of-the-world crime-solver, maintaining a lush penthouse suite in Manhattan, dining in elegant bistros educating an already glutted epicurean palate, pursued by a coterie of lovely vixens smitten by his ruddy maturity, and dedicating the twilight years of his life bringing scoundrels to justice. 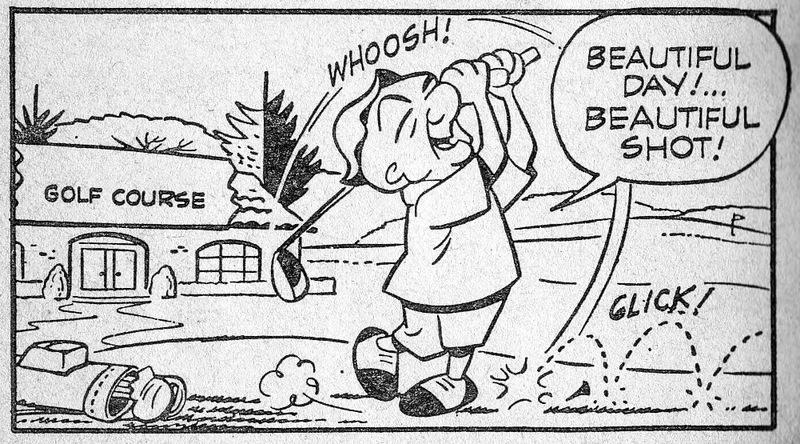 At no point was Hayward suggesting that UPA continue to capitalize on Magoo's nearsightedness. 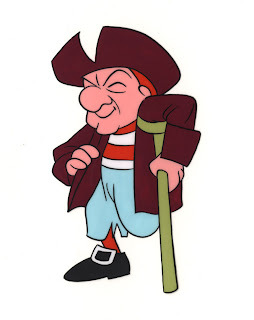 Instead, he saw Magoo as an adult level character again, although he may have been overreaching by pitching Magoo's involvement with the three Bs, booze, broads and bad guys. It was an intriguing notion but once a character has crossed into the juvenile market, it's virtually impossible to bring them back. Most likely UPA realized that as well, as the matter appears to have been dropped. Hanna Barbera later capitalized on the Bond craze, albeit with less panache than Chris Hayward was suggesting, with their feature length film, The Man Called Flintstone. And Hayward did get to explore his takeoff on the James Bond films when he wrote for the spy spoof TV series, Get Smart. Eventually, the studio did adopt the idea of Magoo starring in literary classics, which became The Famous Adventures of Mr. Magoo. This correspondence makes one wonder, though, what other proposals were explored during that year to capitalize on the success of Mr. Magoo's Christmas Carol? 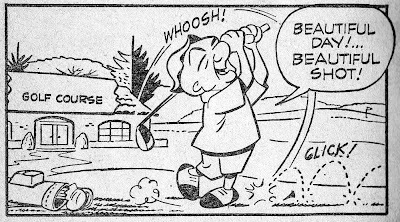 Many of the readers of this blog grew up not only with Mr. Magoo’s Christmas Carol but also with the prime time series that it spawned, The Famous Adventures of Mr. Magoo. 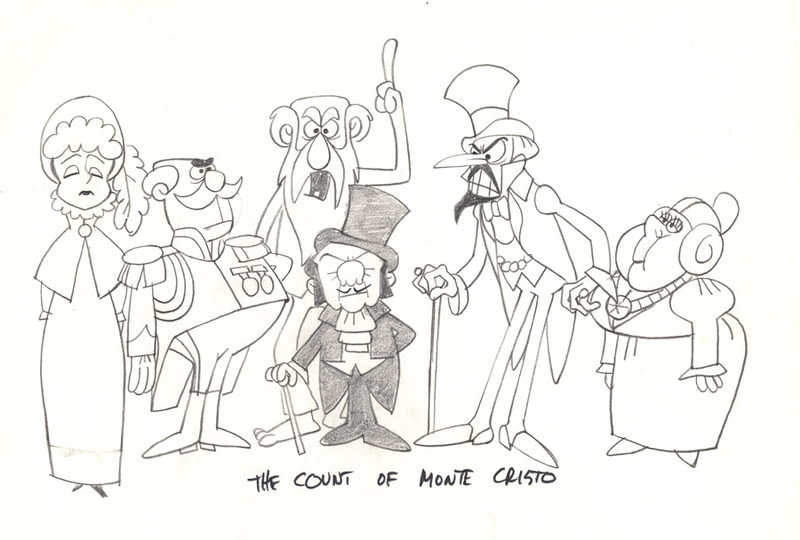 For many, it was their first exposure to the classic literature that was the basis for the show. The series, although memorable, unfortunately did not achieve any where near the ratings success of the Christmas special. 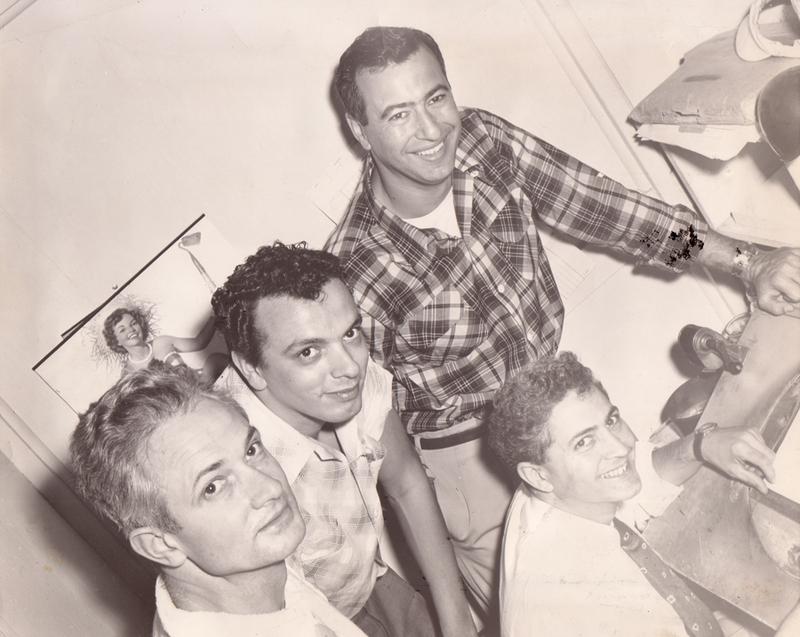 Abe Levitow was the series' supervising director, underneath him were directors such as Christmas Carol sequence director, Gerard Baldwin, former Looney Tunes director, Bob McKimson and former MGM animator Ray Patterson, who were responsible for individual shows and who would work directly with the animators. The writers had interesting pedigrees as well. Below is a breakdown of the writing crew, all freelancers, with the shows they wrote. I’ve highlighted each name with a link to their IMDB page. If you click through, you’ll see that these writers worked on many of the classic sitcoms and dramas of the era. 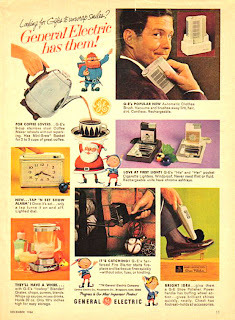 You’ll also notice Mr. Magoo’s Christmas Carol scribe, Barbara Chain, in there. 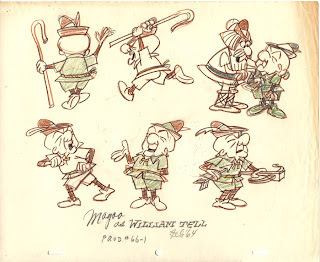 Unfortunately, the only episode from The Famous Adventures of Mr. Magoo to be released on DVD is the feature length Robin Hood series which, because it was stitched together from four separate episodes, is missing scenes from its original broadcasts. 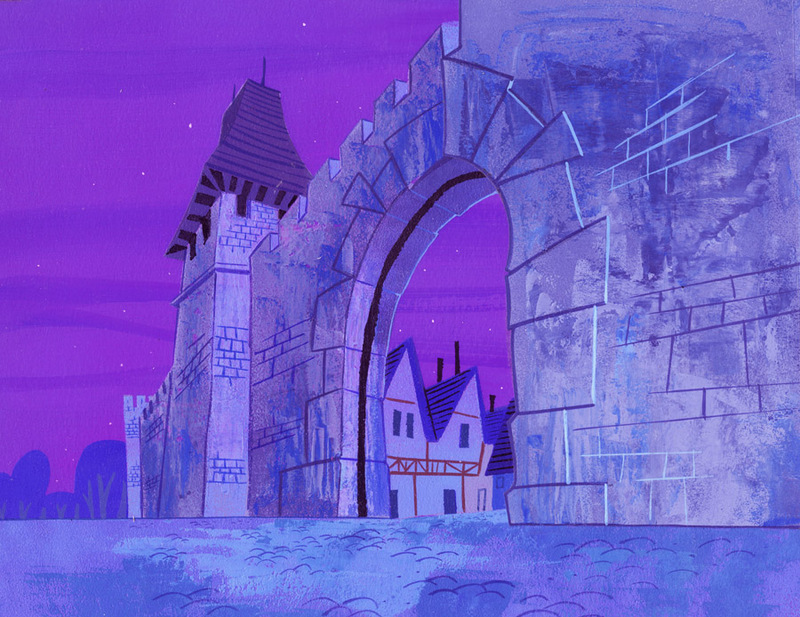 (Right, background by Bob Inman from Robin Hood.) 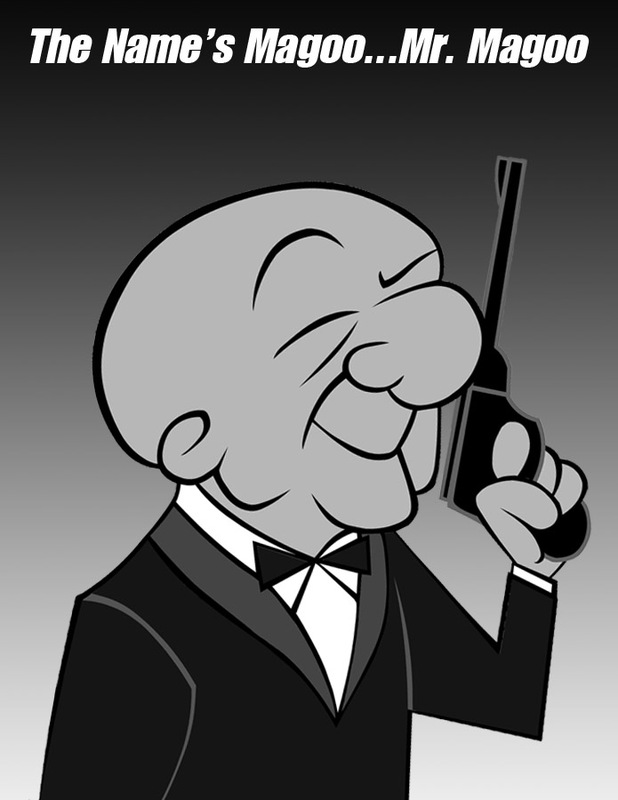 Lack of demand for Magoo product has made Classic Media gun shy when it comes to releasing the entire series. Perhaps with enough interest, they can be persuaded to go back into the vaults. You can contact them here. 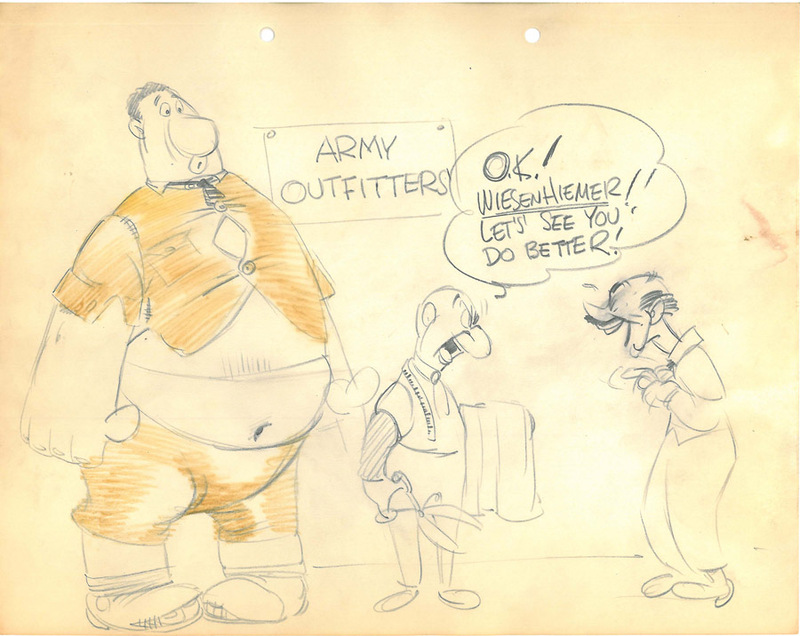 During my interviews with some of the artists and production personnel who worked with Abe Levitow, it became apparent that despite being a highly regarded draftsman, he was a man of few words. Annie Guenther, color modelist on Christmas Carol, who lived near him in Northridge when they both worked at UPA, would sometimes drive him to work when his sports car was experiencing trouble. She remembers that during the lengthy drive to Burbank, Abe spent the entire time thoughtfully puffing on his pipe, never uttering so much as a word. Although every single artist and administrator praised him as being a kind and an unusually supportive director, few could tell me much about him as a person. 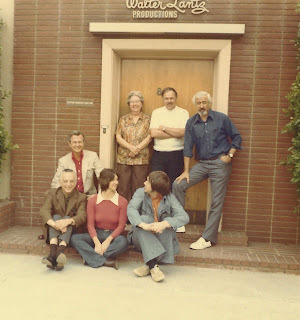 With enough anecdotes and access to his well kept archives, I was able to form a fairly clear picture of the man but I felt that when it came time to consider candidates for profiles on this blog, perhaps the people most qualified to provide insight into the artist who directed Mr. Magoo's Christmas Carol were his family. Following is a remembrance by his three adult children. 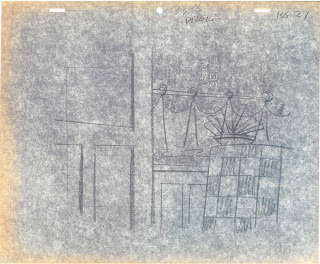 Often he communicated better through drawings than through conversation. “Moosey” wasn’t prone to blowing his own horn, but worked with a quiet pride. Even many years later, we’re told of the fierce loyalty he instilled in those who worked with him. People tell us how he encouraged creativity in others and always tried to get the best work from them. When he died too soon in 1975, just short of his 53rd birthday, he fell into a quiet obscurity undisturbed by the animation revival of the 1980’s. 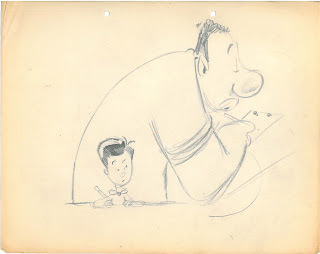 It’s thanks to animation historians like Darrell Van Citters that our dad Abe Levitow’s loving contribution to the field will at last be remembered. Conceived in Ostrolenka, Poland, near the Russian border, our Dad was born in Boyle Heights in East LA in 1922. 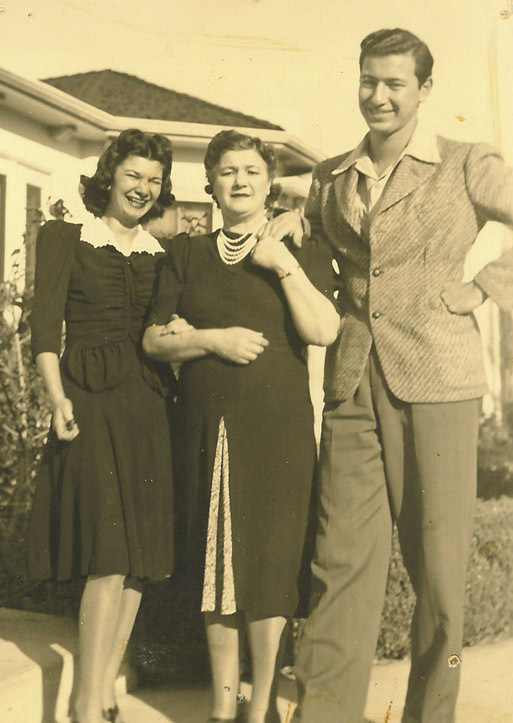 William Levitow, his very pregnant wife Sarah, and their 2- year- old daughter Frances were part of an early wave of Jewish immigrants leaving Eastern Europe due to the upsurge of anti-Semitism amidst constantly changing borders, armies and governments. “Willie” was originally a Talmudic scholar in Vilna, Lithuania, but left to avoid conscription in the various Russian armies to become an artist in a new media…photography. He loved to tell us grandchildren that back in the Old Country everyone thought he was some kind of magician because he could superimpose an image of a man and make him look like he was sitting on a horse. When he came to Los Angeles, he worked as a photo-retoucher for 20th Century Fox and made all the stars’ defects disappear. Willie joined the IATSE #683 film laboratory technicians strike in 1945, found himself on the blacklist and never worked again for the studios. As far as we could tell, from then until after “Willie” grew too weak to lift boxes at his brother-in-law’s grocery store, our grandparents lived on the rents in the little quadraplex they owned on Fountain Avenue in Hollywood. Dad was always a little self-conscious about not having gone to college. But he never stopped educating himself - reading, seeing plays or movies. Throughout his career he continued life-drawing classes. Our Sunday afternoon family outings were most likely to be a trip to the latest exhibit at the Los Angeles County Museum of Art. Fine art books filled our family bookshelves, and Dad had a particular love for the work of powerful draftsmen like Mexico’s Francisco Zuñiga and David Siqueiros. Abe Levitow’s career went on to span over 35 years. 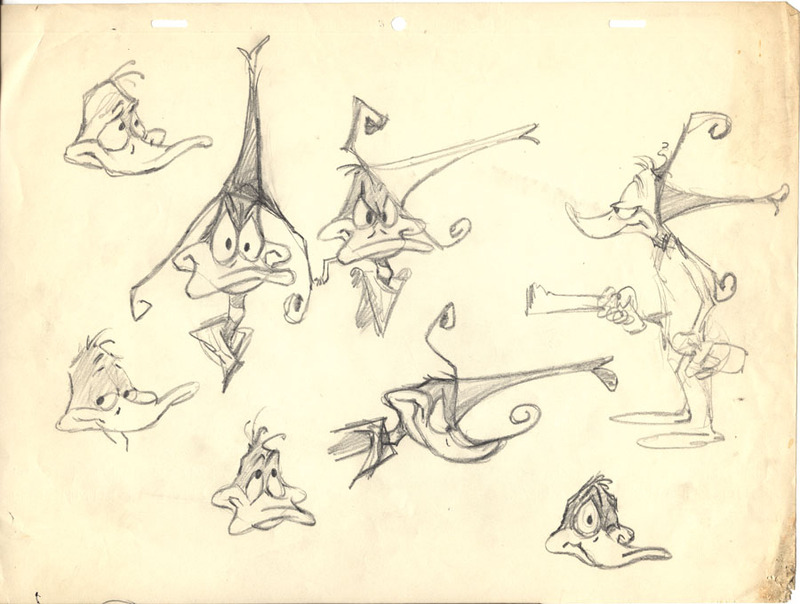 He progressed from in-betweener, to animator, to animation director. 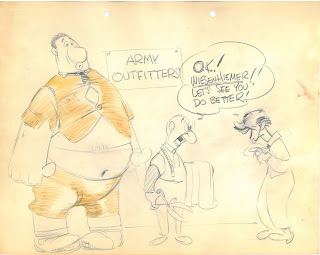 (Above, some of Abe's late '50s doodles.) 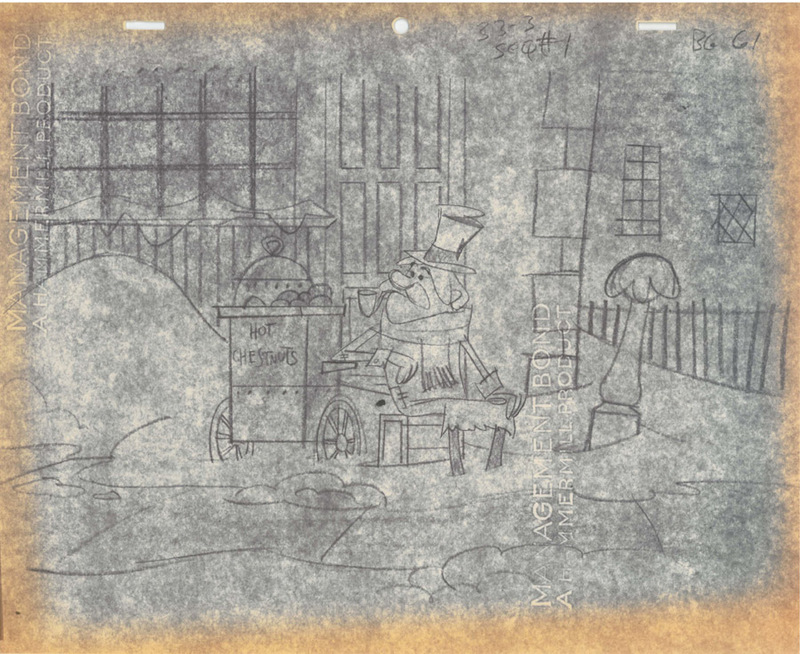 Besides his work with Chuck Jones, he spent a number of years at UPA and worked with Richard Williams in London and LA (below, an original cel setup from Richard Williams' version of A Christmas Carol). We couldn’t be prouder of him and his accomplishments. He’s listed as an animator on eight of Jerry Beck’s “The 100 Greatest Looney Tune Cartoons”, although he had begun animating years before he received screen credit. 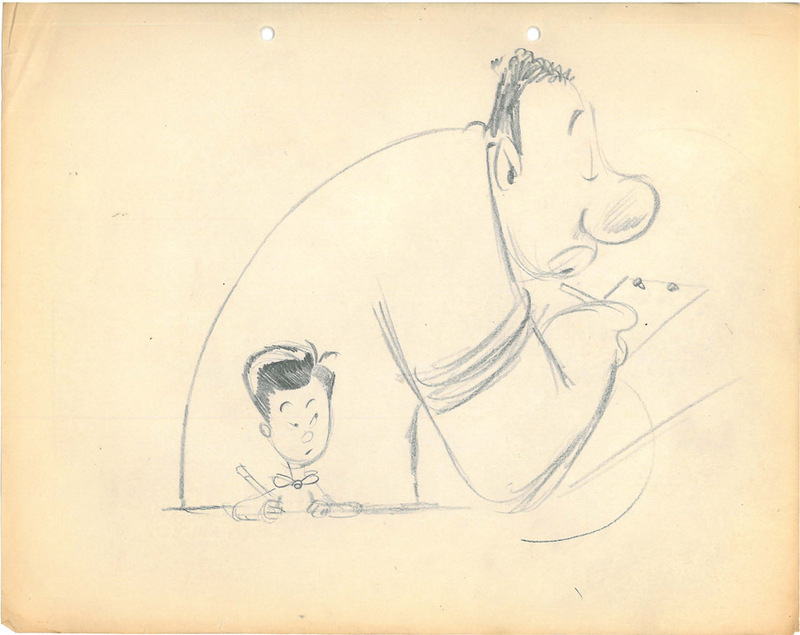 He directed late-UPA favorites Gay Purr-ee and Mister Magoo's Christmas Carol. Many kind testimonials fill our guest book at www.abelevitow.com, a website we created to help bring his wonderful talent back to aficionados of animation history. 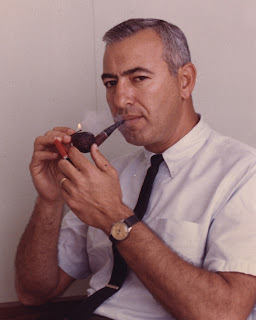 We remember our father as a homebody, not much of a traveler - someone who loved nothing more than spending the evening and weekends doing ink drawings with his kids, working on clay sculptures, and exploring his oil paints. 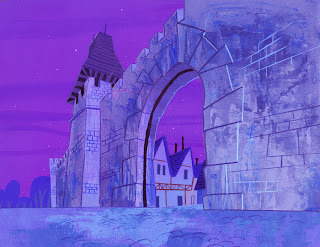 He even painted sets for the local Northridge Theatre Guild. He charmed our mom’s huge extended family and especially all the kids and cousins. He enjoyed summers in San Diego, where we shared an extended-family house at the beach and where he delighted in beach softball and water sports. For a towering man of 6’4”, he was surprisingly gentle. Sometimes he seemed lost in his own thoughts, but if he was in the mood, he could keep the kids and grown-ups laughing hysterically at funny stories or his funny voices. At family gatherings, “Moose” was always the large man with all the little kids crawling all over him, shooting hoops with the older kids in the backyard, or drawing a funny picture of Bugs Bunny or the family dog—whatever struck someone’s fancy.